With company after company going after Google's Lunar X Prize, NASA appears to be a little hot and bothered by the prospect of people messing with all its crap it left behind during prior missions. So it essentially claimed dominion over the moon and passive-aggressively designated a bunch of areas to be off-limits. 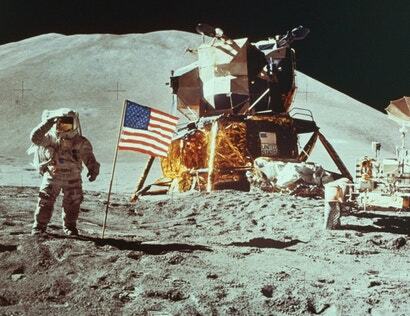 According to NetworkWorld, the American Flag, the Apollo Rover, crash sites, test equipment and footprints are all among the things deemed historical sites by NASA. NASA came up with guidelines — none of which are particularly enforceable — on how others should treat its myriad Moon sites quite a while back. NASA says it "assembled the guidelines using data from previous lunar studies and analysis of the unmanned lander Surveyor 3's samples after Apollo 12 landed nearby in 1969. Experts from the historic, scientific and flight-planning communities also contributed to the technical recommendations. The guidelines do not represent mandatory US or international requirements. NASA provided them to help lunar mission planners preserve and protect historic lunar artifacts and potential science opportunities for future missions."